To be honest with you, I was very curious to see how the stock market would kick off 2019. 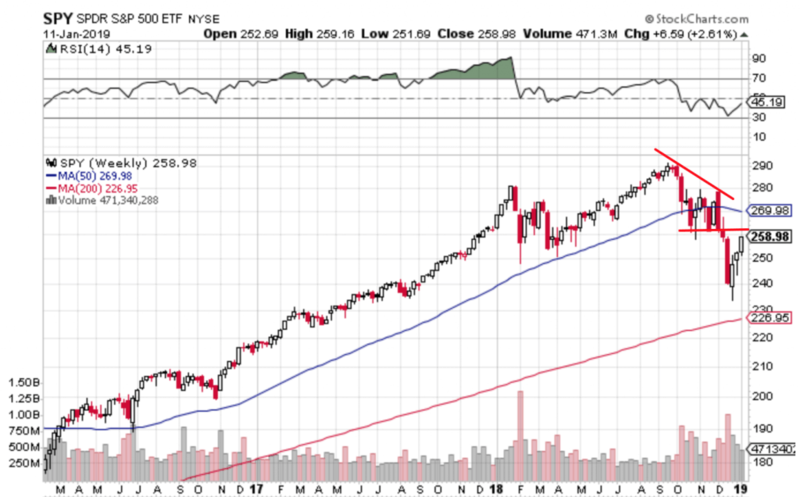 And after last week’s impressive performance by bulls, it looks like we might be finding some meaningful stability (or at least a new trading range). So with the broad market providing a more bullish backdrop, there are finally more individual stock charts setting up under the surface. Alright, now before we look at individual stocks, let’s quickly recap the strong performance by bulls last week and what it might mean for the rest of January. Sound good? Great. 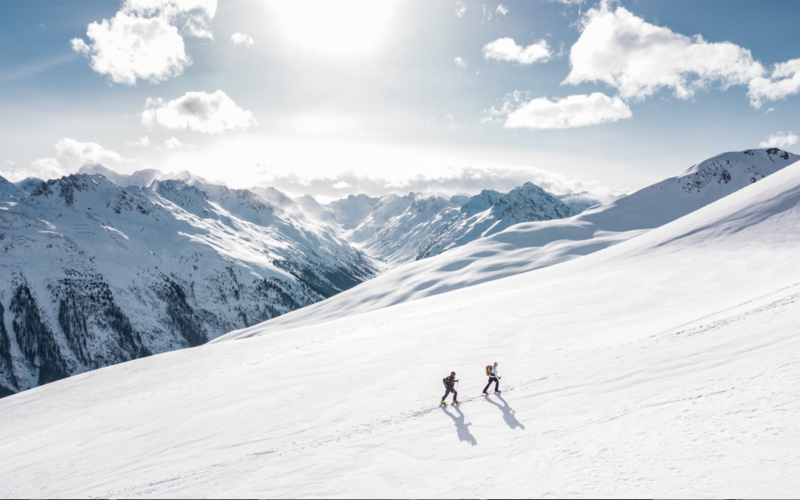 After the weak performance and volatile price action we saw in the stock market during December, I was really intrigued to see what a new year and a new month would bring. And so far, it’s sure been hard to complain! That’s because bulls have done a very impressive job bidding up prices the last few days. And while bears have had a few chances to roll us over, buyers were able to consistently bid prices up into the close. And look, it’s not just large-cap US stocks that have bounced either. Emerging markets are showing some stability, and even the beaten-down European markets put in a significant rally after their horrid performance in 2018. Now we can observe how price acts as it approaches the October-November trading range. With respect to #3, I’m very curious to see if bears are waiting to come out of the woodwork again and push prices lower. Or, will we correct sideways through time and eventually grind higher again? Personally, I believe you don’t need to predict outcomes to make money in the stock market, so I’m doing my best to keep an open mind. But one promising sign is the price action in the consumer discretionary stocks. 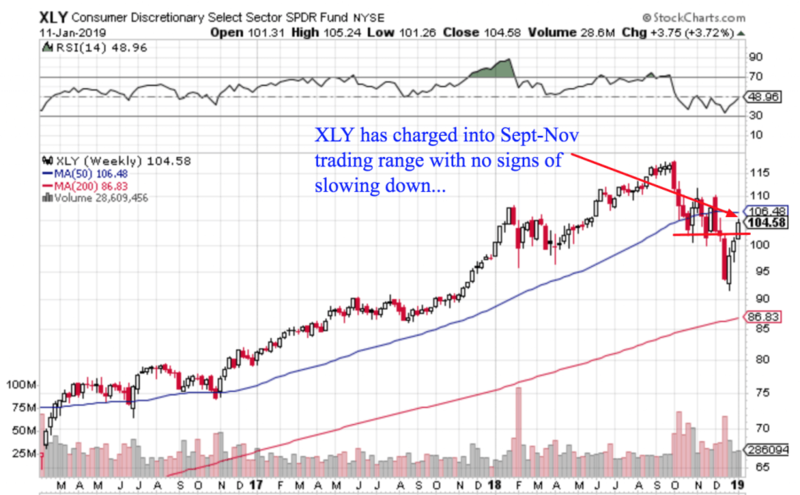 Because as you can see in the weekly chart below, XLY (the respective sector ETF) has been one of the leading groups during this current bounce. And so far, these stocks have done a great job charging back into their trading range without much resistance. 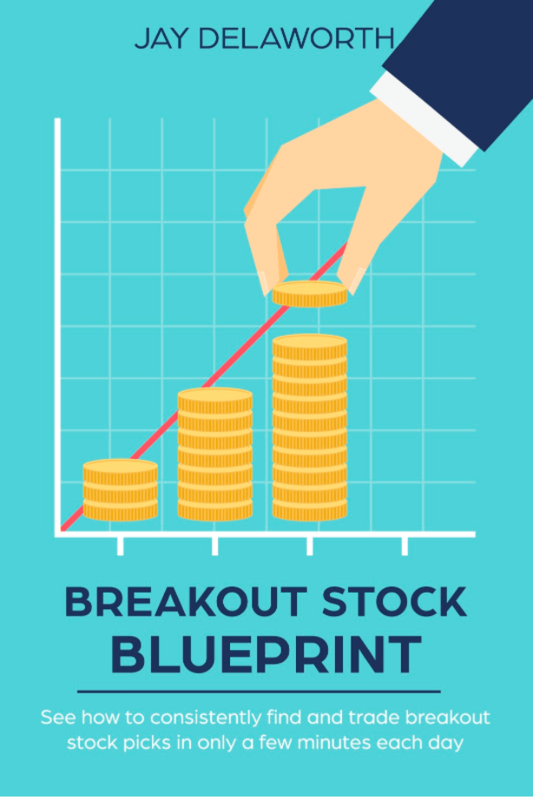 Let’s dig deeper into some specific stock charts of interest for the week ahead! 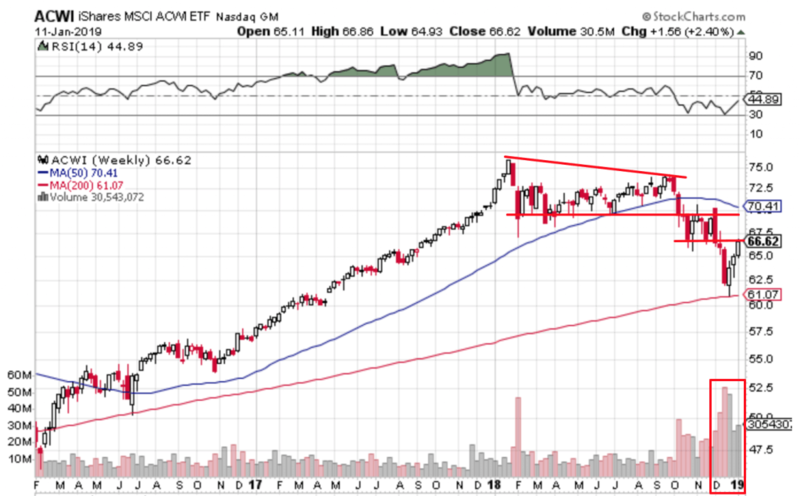 To be frank, the last few months have been tough to find breakout trend following ideas on the long side of the market. But with the turning of the calendar to 2019, that looks like it’s starting to change. So while I still think there’s a case to be made that the indexes will retest the correction lows, which is why the top-down environment should be respected. And yet a lot of individual stock charts are looking appealing in the interim. So as long as I’m careful to manage risk, I’m willing to place some bets. As you’ll see below, many of the leading names right now are in sectors that were leading before the market correction. So I’m happy to see these familiar tickers back near new highs and looking ready for another leg higher. The first chart to show you today is Twilio (TWLO). I had a great trade in this stock last year before getting shaken out in that volatile consolidation. 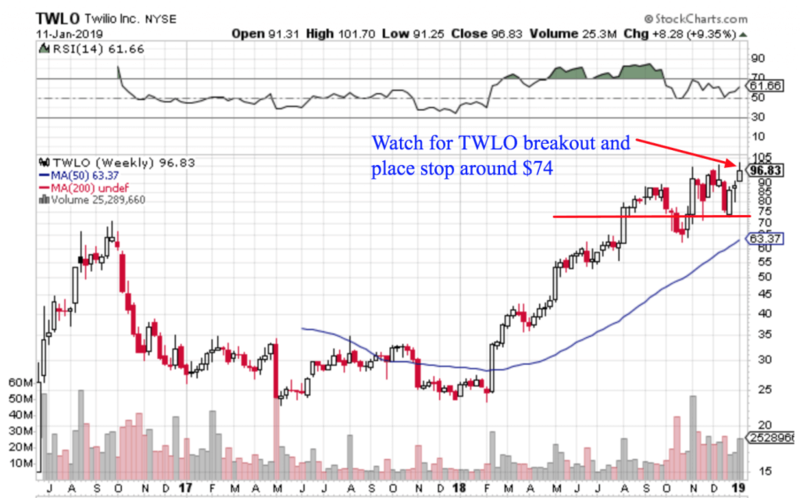 As far as I can tell, not only is the stock chart acting well but the underlying business at TWLO is also humming along nicely. So I’m optimistic another leg higher might be in the cards. 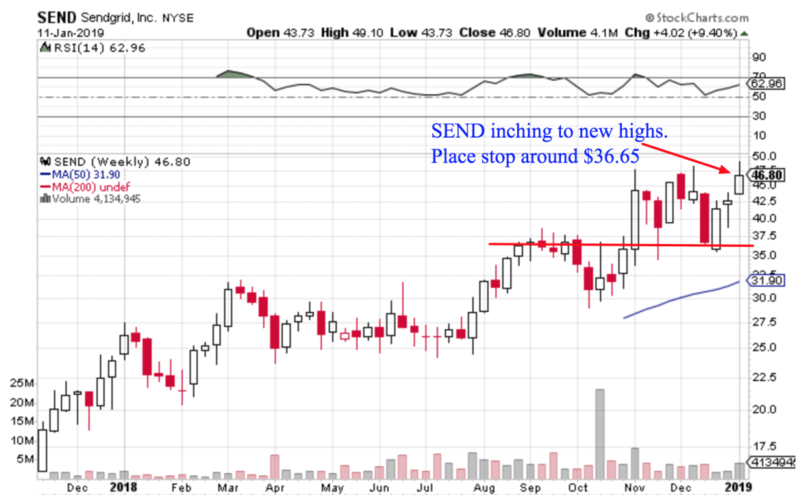 Another leading business software stock you might want to keep your eye on is Sendgrid (SEND). This one also looks to be knocking on the door of new highs after a long sideways rangebound period. So let’s see if these software companies (and the market at large!) can get some momentum next week. I know I’ll be keeping them on my watch list. 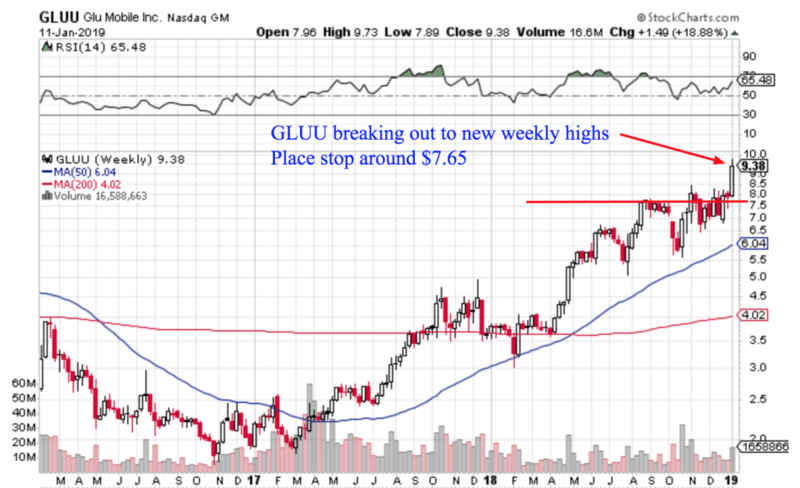 Even though the uptrend in this one is a little bumpy, this mobile game developer looks to be trending in the right direction. As long as you’re careful with stop losses and position sizing, this could be worth a stab. Moving outside of the tech space, there’s one more stock chart I want to show you that has my eye. 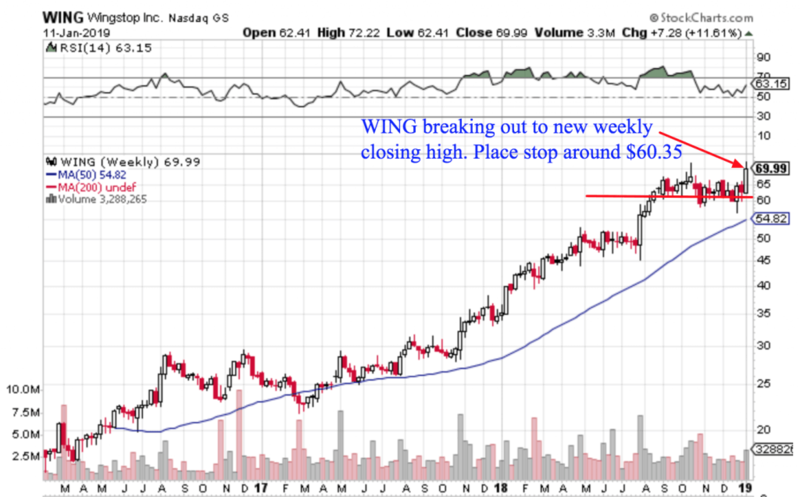 Because personally, I like the way Wingstop (WING) has popped to new closing weekly highs, after a long sideways consolidation. With a strong breakout like that, I’m cautiously optimistic WING can keep trending higher for the next few months and I might decide to take a position this week. Just as a note of caution though: Earnings season is fast approaching! So depending on your holding periods and trading style, you’ll want to adjust accordingly because earnings can have a big impact on how your stocks act.